Happy Monday! I hope you all had a great weekend. Mine was productive and relaxing–exactly what the doctor ordered. A funny thing happened on Sunday. In the middle of the afternoon, despite the perfect weather outside, I got this unshakable craving to watch It’s Complicated. So I stopped what I was doing, cozied into our brand-new couch (love!) and found it On Demand. Oh my goodness. Now that my brain is in full on home decorating mode I was drooooooling over every detail of Meryl Streep’s home and bakery. There were definitely moments when I paused the TV, got up, and examined every square inch I could see. I just want to move right in or order one of everything for our new place (chocolate croissants included). In. My. Dreams. Anyhoo, let’s talk shrimp. 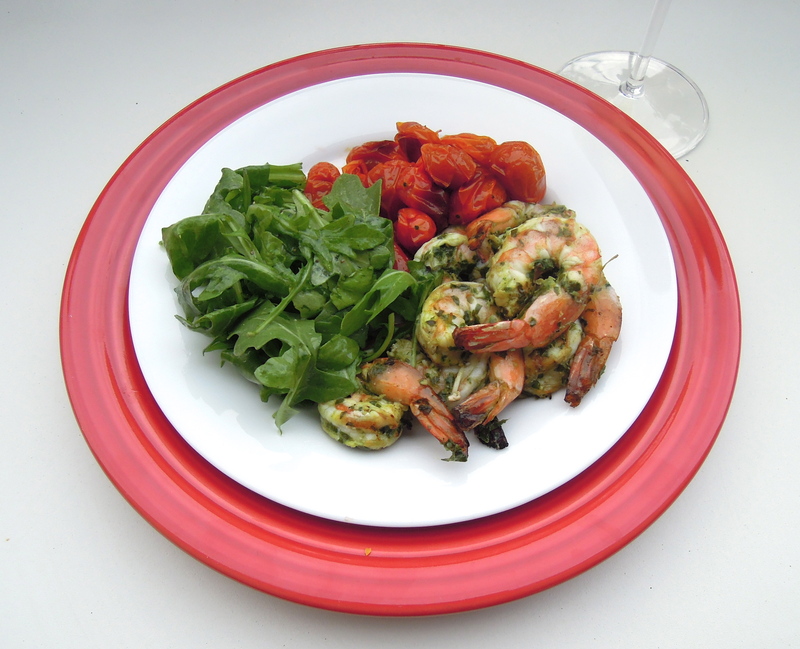 Delicious, pesto grilled shrimp. I’m so in love with the flavors this time of year, I can’t get enough. Can’t stop won’t stop. What you see here: Basil, garlic, squeezed lemon juice, sprinkle of s & p, all whirled in a blender with olive oil. That’s it! The hardest part of this meal is remembering to marinate the shrimp for a little while, but I’m sure it’d be just as spectacular if you only bathed them in the marinade while heating the grill. 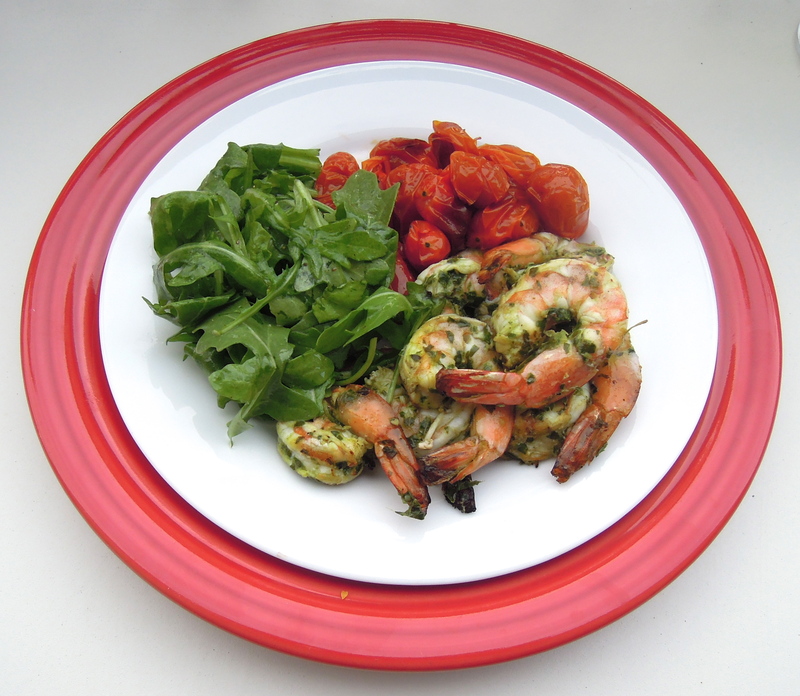 We served the shrimp alongside roasted cherry tomatoes (toss with olive oil, s & p, and roast in a 400-degree oven for 20-30 minutes) and a simple arugula salad, but absolutely any seasonal eats would do. Pour yourself a crisp glass of chardonnay and you’ve got yourself a stellar evening meal. Dear summer, please never end. In a blender or food processor combine basil, garlic, lemon juice, and salt and pepper. Blend/pulse until smooth. Slowly add the olive oil until combined. In a bowl, combine shrimp and pesto and marinate 20 minutes to a few hours. Thread shrimp onto skewers (I used 3). Be sure to soak skewers for about 30 minutes ahead of time to prevent burning. Heat grill to medium heat and grill shrimp about 3 minutes on one side, flip and cook 3 minutes more. Remove when all shrimp turn pink and opaque. This entry was posted in Fish on August 5, 2013 by Paige Greenfield.